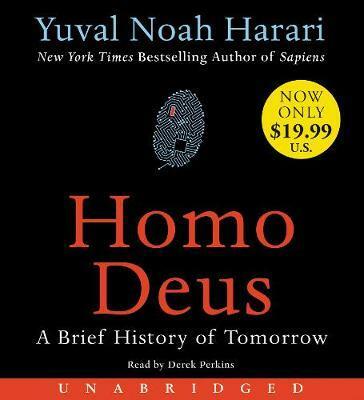 Yuval Noah Harari, author of the critically-acclaimed New York Times bestseller and international phenomenon Sapiens, returns with an equally original, compelling, and provocative book, turning his focus toward humanity's future, and our quest to upgrade humans into gods. Over the past century humankind has managed to do the impossible and rein in famine, plague, and war. This may seem hard to accept, but, as Harari explains in his trademark style--thorough, yet riveting--famine, plague and war have been transformed from incomprehensible and uncontrollable forces of nature into manageable challenges. For the first time ever, more people die from eating too much than from eating too little; more people die from old age than from infectious diseases; and more people commit suicide than are killed by soldiers, terrorists and criminals put together. The average American is a thousand times more likely to die from binging at McDonalds than from being blown up by Al Qaeda. What then will replace famine, plague, and war at the top of the human agenda? As the self-made gods of planet earth, what destinies will we set ourselves, and which quests will we undertake? Homo Deus explores the projects, dreams and nightmares that will shape the twenty-first century--from overcoming death to creating artificial life. It asks the fundamental questions: Where do we go from here? And how will we protect this fragile world from our own destructive powers? This is the next stage of evolution. This is Homo Deus.